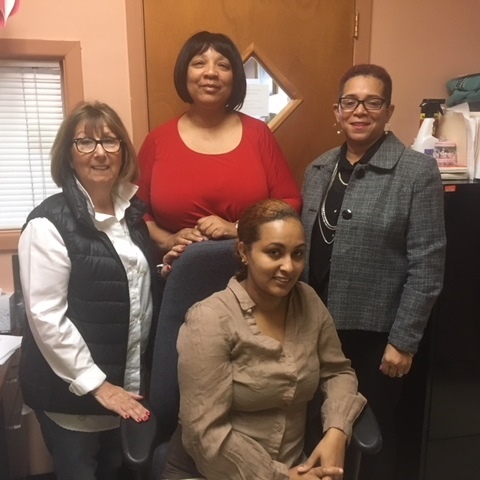 CAPTION: (Left to right) Marianna DeVincentis, grant writer; Susan Moore, Family Self-Sufficiency coordinator; Peggy Wade, acting director, Section 8 Rental Assistance Program; (seated) Cristina Mateo, assistant housing manager. Orange, NJ – February 28, 2018 – For the eleventh consecutive year, the Housing and Urban Development has renewed the Family Self Sufficiency Grant for the Housing Authority of the City of Orange that helps low-income residents achieve economic independence. The Family Self Sufficiency program is a voluntary, five-year program aimed at helping Section 8 residents gain economic security and independence. It has had a constant stream of 25 to 30 participants yearly since the Authority hired a coordinator, Susan Moore, in 2008. To successfully graduate from the program, a FSS participant must become employed, be free of welfare assistance for at least 12 months, and substantially achieve the goals in their self-sufficiency plan. Although the basic program length is five years, many families graduate in less time. The program has two components: escrow accounts and case management. Together, these two elements work to help families build assets and make progress toward self-sufficiency. Residents with Section 8 certification apply for the program and work with a case manager to identify needs and goals. Moore tailors a program for each participant to help them become gainfully employed and welfare free. The participants make a five-year contract affirming their goals. The case manager helps the resident remove obstacles, such as finding affordable childcare or resolving transportation issues, so that they can live more productive and fulfilling lives. Program participants also benefit from the FSS Escrow Saving Account. Low income families receiving housing assistance pay 30 percent of their adjusted income for rent and utilities. Their rents rise with their incomes, and that increase is matched and put in an escrow account. Either upon completion or after five years in the program, the participants receive their escrow money with interest. They can use that money as they wish. Some buy houses, others go to school or buy cars. One successful participant was Orange Housing Authority’s assistant housing manager Cristina Mateo, now a proud homeowner in the city. She successfully completed the OHA’s Family Self-Sufficiency Program that enabled her to save money.